Photographer(s) Appreciation: Today's photo shows Fissidens obtusifolius, taken by Robert Klips (aka Orthotrichum@Flickr). Robert has been posting so many great photos to our Flickr site that this is the second entry in a row featuring his work. Thanks Robert! Members of the Fissidentaceae are set apart from similar taxa by two determining features. Firstly, they have distichous leaves, meaning that the leaves are arranged in two vertical rows on either side of the stem. Secondly, they have equitant leaves; the bases of the leaves overlap those growing above them. 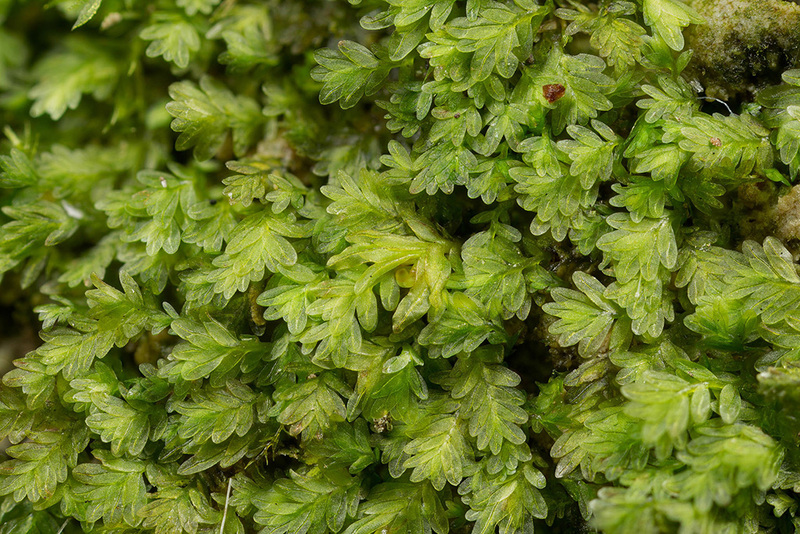 Both of these characteristics can be seen in Robert’s photo, but if your eyes are not eagle-sharp, you might appreciate the magnified image of blunt-leaved pocket moss at the Ohio Moss and Lichen Association website. The ovate to oblong, broadly obtuse leaves have inspired Fissidens obtusifolius‘ species name; these leaves are about 1mm in length and have no teeth. Fissidens obtusifolius is found in eastern North America on wet limestone and limestone-bearing sandstone. It is almost always found near water, or in the recesses of wet cliff faces. I love that Robert’s photo makes the scale of this species ambiguous. I have the image filling my computer screen, making it look showy and extravagant (for a moss), but in reality this moss is easily-overlooked and reaches a height of only 1 cm. Thanks, Robert, for taking the time to notice the little things! Thanks for qualifying that this moss — which looks quite large in Robert’s excellent photo — is really very tiny and almost un-noticeable. Very interesting. Yes, the minute I saw the word “moss” I realized that those leaves were probably a lot smaller than they looked, and also that their size probably explained their otherworldly appearance. Nice write-up! Even nicer photo! Go Tamara! Interesting commentary and a beautiful photograph…. You have been doing an outstanding job with or without Daniel. Your postings have been interesting, informative and sometimes humorous. Very enjoyable reading and viewing. Thank you! would it be possible to put scale markers on the photos? would be nice to get an idea of size, especially with small plants like the moss.